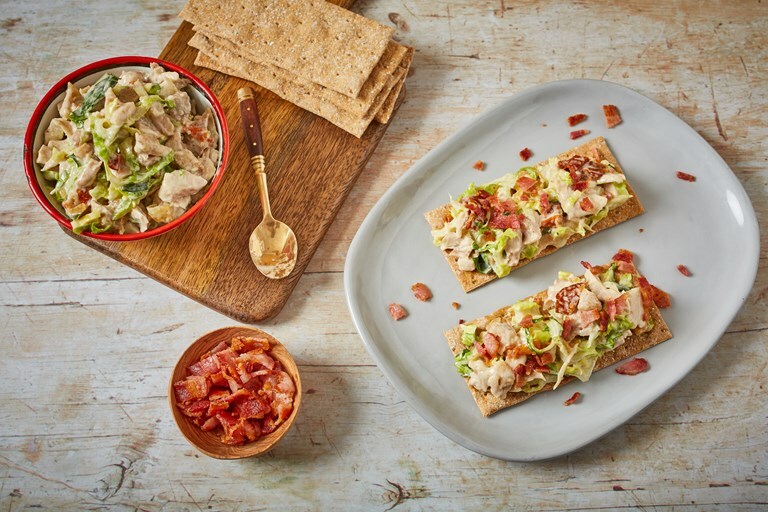 This stunning combination of roast chicken, bacon, lettuce, tomatoes and basil creates the perfect topping for Peter's Yard crispbreads. Stirring the chicken roasting juices into the mayonnaise adds bags of flavour which you simply couldn't get from a shop-bought sandwich filler. What makes this the best-ever chicken BLT recipe is the indulgent and addictive mayonnaise, which is stirred into the roast chicken juices. The chicken, mayonnaise and crunchy bacon bits can be made in advance, but be sure to fold through the baby gem just before serving for a nice fresh crunch. The mix also works nicely with chopped cherry tomatoes or diced avocado folded through it, so have a play with different flavours.